Cast: Ice Cube (Calvin Palmer), Common (Jabari), Nicki Minaj (Draya), Anthony Anderson (J.D. 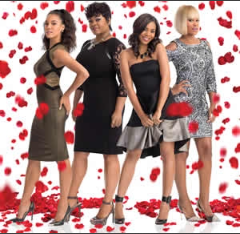 ), Cedric the Entertainer (Eddie), Regina Hall (Angie), Garcelle Beauvais (Loretta), Sean Patrick Thomas (Jimmy), Eve (Terri), Deon Cole (Dante), Tyga (Whack MC), J. B. Smoove. Details: On this date MovieWeb reported that Barbershop: The Next Cut is bringing the Beauty Shop inside their doors for a joint business to help both parties keep afloat, and with the girls and guys working side by side, you can bet that every day is going to be a party. That is, if the raining bullets don’t accidentally kill someone first. There’s a serious new problem in town. And it needs to be addressed by a community that can actually do something about it. Ice Cube’s Calvin Palmer has a young son growing up in a Chicago suburb where the presence of gang violence is growing by the day. And it is encroaching on his business. It’s a serious issue that Barbershop: The Next Cut seems to be cutting into with some humor, making for a slightly more serious affair than past sequels. Joining the cast this time around is also Common, who is now married to the only woman working on the Barber side of the shop, Terri, a character being reprised by Eve. Their personal journey will be one of the many side stories on display in Barbershop 3, as each of the shop’s employees work through their own struggles in the face of a neighborhood that seems to be under constant attack. Source: MovieWeb. 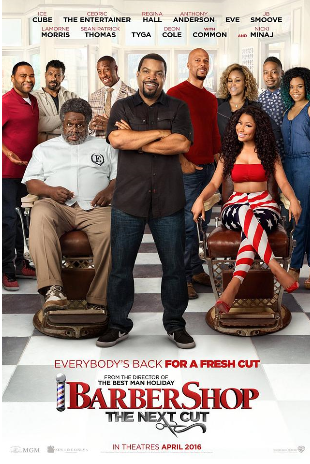 Update: According to Shadow and Act, Barbershop 3 is set for a February 19, 2016 release, with a cast the seemingly continues to grow, including additions, Deon Cole, Nicki Minaj, and Regina Hall, who have all booked roles in the New Line/MGM threequel, joining the previously cast Michael Rainey Jr., Common, Anthony Anderson and returning stars Ice Cube, Cedric the Entertainer and Eve. Malcolm D. Lee is directing, from a script penned by “Black-Ish” creator, Kenya Barris and Tracy Oliver. Ice Cube’s Cube Vision shingle is producing, with Bob Teitel and George Tillman, Jr. of State Street Pictures as lead producers. Collectively, the first 2 movies grossed $140 million domestically on comparatively low budgets, and were financial successes for the studio. As of May 5, 2015, according to Movieweb, it isn’t clear at this point if other original franchise stars such as Sean Patrick Thomas (Jimmy), Troy Garity (Issac), Michael Ealy (Ricky) and Leonard Earl Howze (Dinka) will also come back for the follow-up. Source(s): Shadow and Act, MovieWeb. On March 26, 2014 Deadline reported that MGM is reviving its Barbershop franchise. The film company is negotiating a mid-seven-figure deal with Ice Cube to reprise his role as the catalyst for Barbershop 3. They also hope to re-enlist Cedric the Entertainer and Queen Latifah as well. The 2002 original cost $12 million and grossed $75 million domestic while the 2004 sequel cost $30 million and grossed $65 million. Source: Deadline.